While I’d like to accredit the infamous Spaniard with being as big a fan of baking as I am, he is, of course, referring to the importance of a full stomach to society in general, daily bread being a synonym for food. Going back tens of thousands of years, bread has been a staple of cultures around the world, playing its part in everything from riots and revolution to tea time treats and the humble packed lunch. But attitudes to bread are changing. No longer in need of the extra calories and carbohydrates as we sit at our desks with a more sedentary lifestyle, society is getting fat and bloated from excessive consumption of the previously popular wheat. Bread baskets are shunned, burgers served in lettuce leaves rather than buns and (often insanely sugary) cereals seem to be overtaking toast as our breakfast meal of choice. As we try to cut excessive wheat from our diets, the food giants are plugging billions into making sure they keep up. Loaves now come smaller and lighter, enriched with strange ingredients and boasting their health-giving properties in any way possible. I’m not a fan of mass produced bread at the best of times (look at a pre-packaged loaf next time you’re in the supermarket and if – as is likely – it contains more than ten ingredients, you’ll see what I mean), but perhaps the most pernicious of all these marketing tricks is the ‘Crusts Away’ loaf, a crustless (what?! ), sorry looking loaf with ‘hidden wholegrain’ for those who couldn’t possibly cope with even the tiniest taste of wholemeal flour. While I appreciate that bread isn’t for everyone, that there are some very serious gluten allergies out there and that obesity is an issue that isn’t going away, I would argue that these sorts of mass produced loaves are simply feeding the problem rather than helping it to go away. Bread should be enjoyed in moderation, made from fewer than five ingredients (unless you’re adding spices etc) and eaten with respect, not crammed with preservatives and stashed in a sweaty plastic wrapper that will allow it to last for weeks. Speaking of fooling people with appearances when it comes to bread, the lovely little loaf featured in this post does exactly the opposite of those hidden wholemeal loaves. 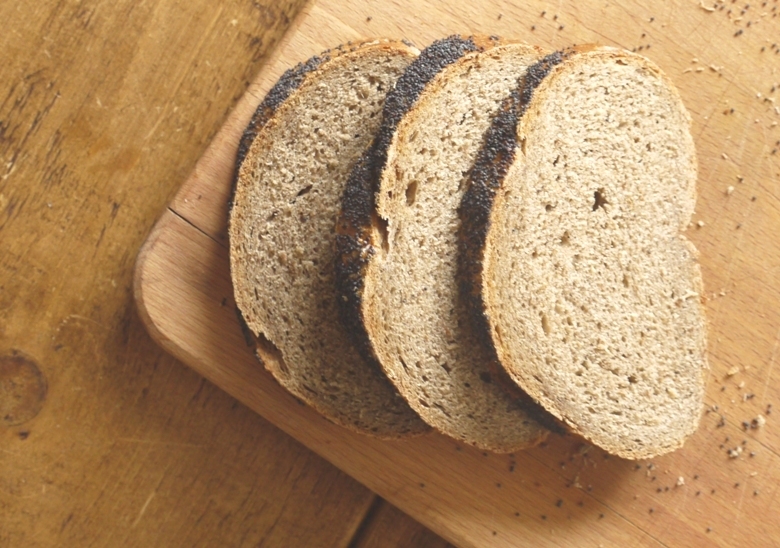 Made with two thirds white flour to one third rye, the addition of coffee makes the crumb a lovely light brown, giving the appearance of a slightly more wholesome loaf than it actually is. Perhaps not something to boast about but, as I said above, a little bit of anything enjoyed in moderation should be absolutely fine. Having said that – and yes, I’m aware that this post is full of contradictions – you may find it pretty hard to moderate your consumption of this bread. 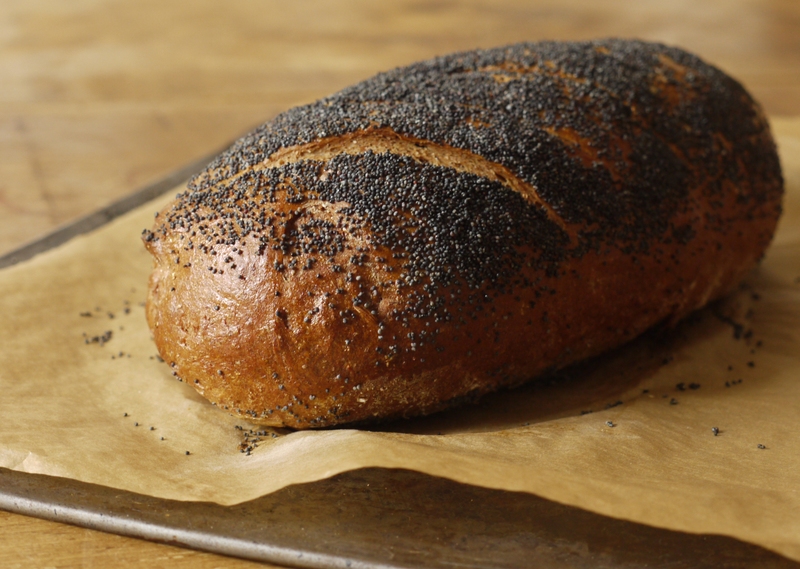 It’s beautifully soft with a shiny, golden crust, crunchy with poppy seeds and strongly spiced with both black pepper and fennel seeds. Freshly sliced it’s a dream, delicious with smoked salmon and cream cheese or other salty, smoky flavours. Toasted up it’s even more aromatic, wonderful with a smear of homemade hummus or simply spread with salty butter. I made this loaf to give to my Mum for Mothers Day last weekend. As someone who doesn’t wear perfume or eat chocolate and who prefers the flowers growing in her own garden to anything cut or imported using unnecessary air miles, my Mum is a pretty hard person to find presents for, but I’m hoping this did the trick. As soon as she’d tasted it, she asked me for the recipe (a Dan Lepard creation which you can find on the Guardian website, here – I didn’t change a thing) and that’s the highest form of praise in my book. I hope you enjoy it as much as she did. Sounds lovely and reminds me of the fennel seed breads I was devouring in the Dolomites, will give it a whirl over Easter! Have just greedily eaten toasted homemade hot cross buns for breakfast – one to recommend though I’ve definitely got some work to do on perfecting the recipe, they are certainly quite cross! and this was attempt no 2! I do love a good hot cross bun – am thinking of trying a hot cross loaf this year! I have nothing to add. I simply admire the post very much. I do love that quote – and totally agree. Can’t imagine life without bread. I LOVE this loaf from Dan Lepard. The first time I made it I was so sceptical about the recipe, but it totally paid off – such a delicious moist texture and yummy nutty flavour. Now I really want to make it again! I would love such a pretty (and delicious I assume) gift and couldn’t agree more with all you have to say about modern society and industrial bread. Oh that crust looks so beautiful! Making your own bread is so rewarding! I bought a breadmaker a few months ago. It takes the hard work out of it so it’s a small effort for great reward. My bread doesn’t have a long list of slightly spooky ingredients and I wake up in the morning to the smell of fresh bread. I’ll try your recipe this weekend. It sounds perfect for brunch. Oh Kate, I absolutely agree about giving bread as a gift! I think most people would appreciate it. I baked some rye a few weeks ago too, and it´s one of my favorite flours, though I don´t use it that much. This loaf is gorgeous both in color and shape! I hardly ever buy bread for myself from good bakeries, let alone a supermarket. It sounds like a good loaf and an excellent present. Intriguing recipe, however. Can you taste the coffee at all? Not really, I’ve said in another comment response, it just adds a rich, earthy sort of note. P.S. Could cumin or coriander work? With the coffee and everything?! The rye flour certainly adds a special something to it, but you could probably sub in wholemeal flour. As for the spices, you could use caraway and although it would be a different thing, cumin or coriander seeds could also be nice. The coffee flavour doesn’t really come through, just adds a sort of earthiness. Hope that helps! I so agree with your philosophy about bread; a little good bread is something to be enjoyed and savoured. And this looks like a very good bread indeed – such a lovely combination of flavours. 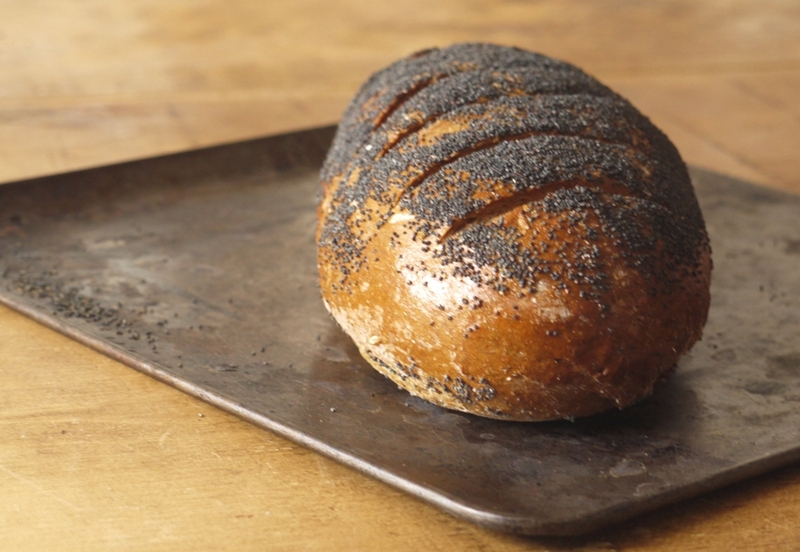 Rye, pepper, and fennel sounds like such a perfect savory bread combination. I would be all over a sandwich or two made with this! Totally agree with you on the commercial bread. My gastroenterologist swears about 80% of the people he sees are because of the bad bread we eat in the UK made with the evil Chorleywood method packed with sugar, preservatives and without a proper rise. My issues are non bread related but if I take my horrible medicine, he said he’d reward me with a sourdough starter! I like the idea of spreading good bread love! That’s exactly what Richard Bertinet said when I went on his baking course! I know that bread is brilliant for you, but people have been surviving on it for tens of thousands of years so it can’t be all bad! What a wonderful looking loaf! Ahhh I loved reading this post. I agree completely. When I was talking to someone the other day and they said they were trying to cut out bread because of the new findings that “it’s not that good for you anyway,” all I could think in my head was, “yes, it’s not good for us. That’s why humans have subsisted on it for hundreds of years just fine!” Sigh it’s a shame bread isn’t appreciated, as it’s some of the best food. Especially bread like this– homemade, hearty. Delicious. I’m overwhelmed by how lovely this loaf is. I adore rye, and I would love to make this. Bread is one of the most special gifts one can give. Beautiful. Thank you 🙂 I need to try making a 100% rye loaf next – I’ve only tried once before and it was a little like a brick. If you know any good recipes, do let me know! I’m a big Dan Lepard fan but I thought that one sounded a bit weird. Thanks for changing my mind – it looks lovely. Will be making it soon. My partner loves bread and I made a new year’s resolution to never buy bread again. It’s been a really easy one to keep and I’m finding out that bread is fun to make and good to eat. I never really cared for it before, simply because I don’t like sandwiches or toast, so a slice of shop bought bread and butter was always a non-event. Just read the recipe … wow coffee? Yep! 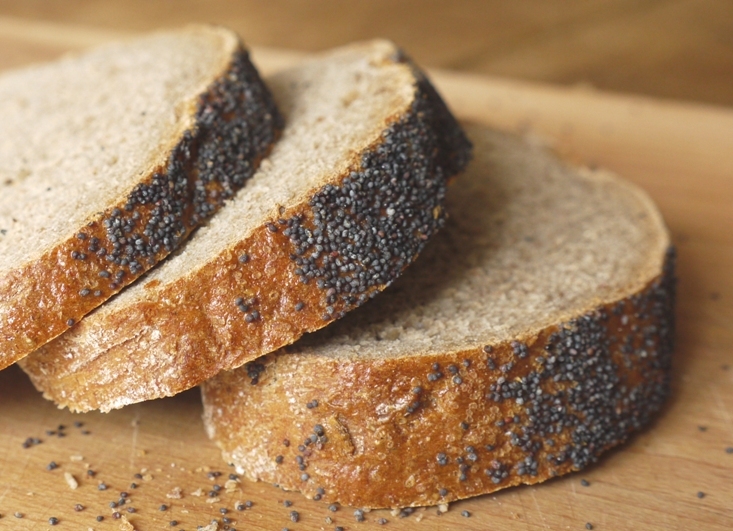 Sounds bizarre but it works – I promise it doesn’t taste like a coffee loaf! your bread looks perfectly browned and beautiful! yum! That looks like an excellent loaf. Very handsome. Yes, completely agree! I don’t think it’s the artisan loaves that are the problem, I’m pretty sure it’s the chips and cookies and all that lot. Bread is just wonderful fresh; the smell, the taste, but most of all the texture! The thought that someone is trying to sell crustless bread makes me want to cry…The world is a frightening place, sometimes. 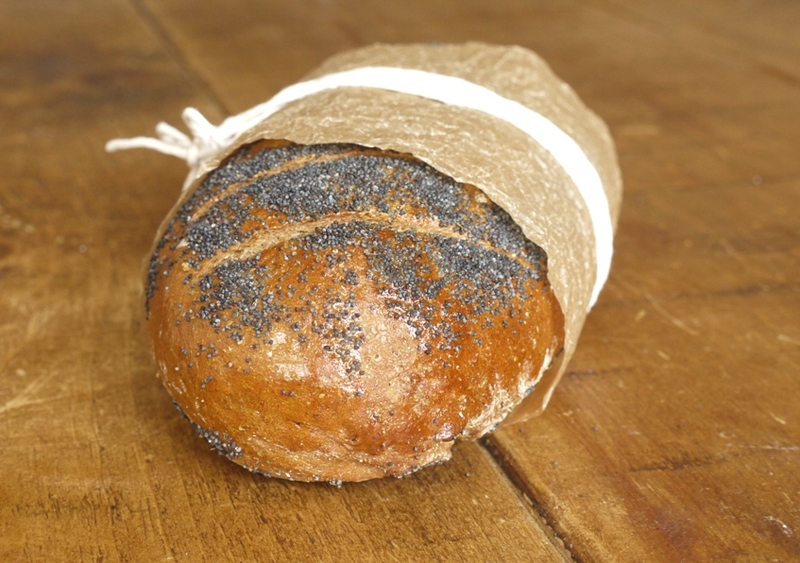 Your loaf looks just beautiful, I love the poppy seed adornment! Oooof this looks incredibly delicious! This loaf looks incredible! store bought wouldn’t have a patch on this! This is so beautiful! And delicious! It’s too bad my mom doesn’t like rye, she’d love this kind of gift too. Bread with coffee? I’m in! Yummy yum yum 🙂 Coffee though, blimey, who would have thought! Haha, adding coffee. That made me laugh. It does look like an absolutely perfect loaf though and would make a change for me from my usual rye sourdough – which I have to say I would be lost without now. Your crusty top looks particularly appealing and I’m quite taken with the addition of black pepper. Your mother doesn’t like chocolate? Are my eyes deceiving me? I’m not great at bread, but I really want to try these flavours. Smoked salmon and cream cheese on fennel bread sounds delicious. I just stumbled upon your blog. This looks so delicious! Thanks for your lovely comment. 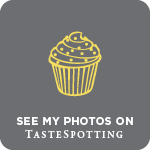 Just had a little look around your blog – that croquembouche looks incredible!